Cultural vitality is a public good and an essential component of a high quality of life. Culture and expressive life are guilt-free spaces in which societies and governments can share values through creative practice. Through Global Cultural Strategies, Bill Ivey works with those individuals, agencies, and organizations that are dedicated to advancing citizen-oriented public policy in support of a vibrant expressive life for all. 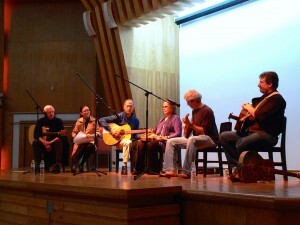 In the fall of 2014, five folklorist/journalists toured China performing old traditional and popular songs, discussing the great revival of interest in folk music that took place in the US during the 1960s and 1970s. China is an ancient civilization with a new government, the US is a new civilization with an old government. Each country offers folklore scholars distinctive situations in which to work, and the study of traditional culture constitutes a rewarding arena of comparison and collaboration between China and the US. 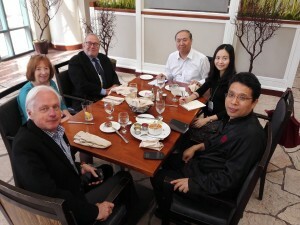 The China Folklore Society, American Folklore Society, Chinese Institute for Intangible Cultural Heritage, and the Chinese Academy of Social Sciences have been key partners in producing bilingual and comparative lectures, conferences, and publications on folklore subjects. 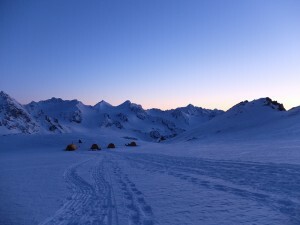 Four tents, eight people on glacier March 3, 2016. Sunset, temperature drops, everybody gets cold.